​ Very Worshipful Brother Anthony Latham, APGM, escorted by W.Bro. Brent McMurray, ProvAsstGDC, had the pleasure in visiting the Chelmer RAM and Mark Lodges, No. 342 in early January at their meeting place in Chelmsford. In a meeting tinged with sadness following the tragic loss of their Worshipful Master, W.Bro. John Edwards, there was still a lot to celebrate and enjoy. Pictured below are the APGM, with W.Bro. Mike Steen who took the Chair in the absence of John. W.Bro. Steen is holding the MBF Grand Patron Gold Award which V.W. Bro. Latham had presented earlier that evening. A splendid recognition of the charitable efforts made by members of the Lodge towards the good causes supported by the MBF. On the right of the APGM is Bro. Barrie Harding who had been elevated at the RAM meeting and who had been presented with his Mark Grand Lodge Certificate. Also pictured is V.W.Peter Roast (standing behind to the left of Bro. 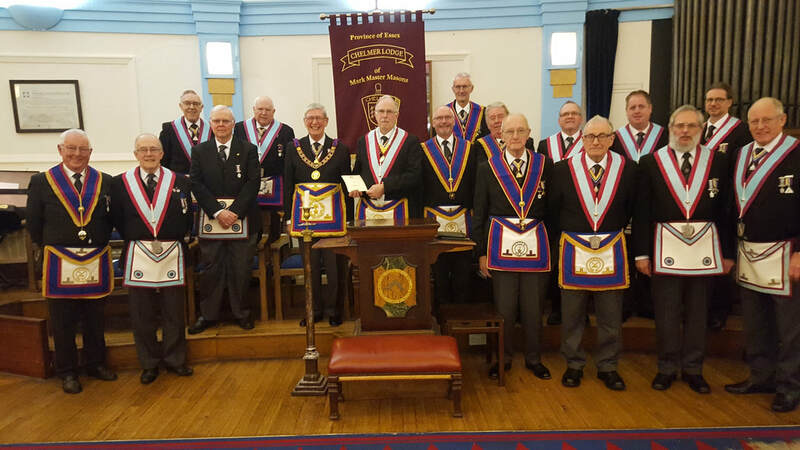 Barrie) who treated the Mark Lodge meeting to a very good Lecture on the Degree of the Mark Master Mason and an equally good Explanation of the Mark Tracing Board- what an excellent memory!. " .